"41MR12, Burial I, 52" by Timothy K. Perttula and Robert Z. Selden Jr.
DECORATION: The upper rim panel is plain, but the lower panel has engraved interlocking horizontal scrolls. There are hour-glass shaped engraved elements on either end of the central scroll line. Each of the interlocking scrolls are divided by other hour-glass-shaped engraved elements that extend from the rim to the vessel carination. 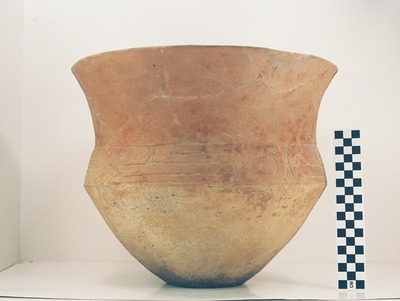 Ripley Engraved compound bowl, MR12-52, from Burial I at the Ben McKinney site.